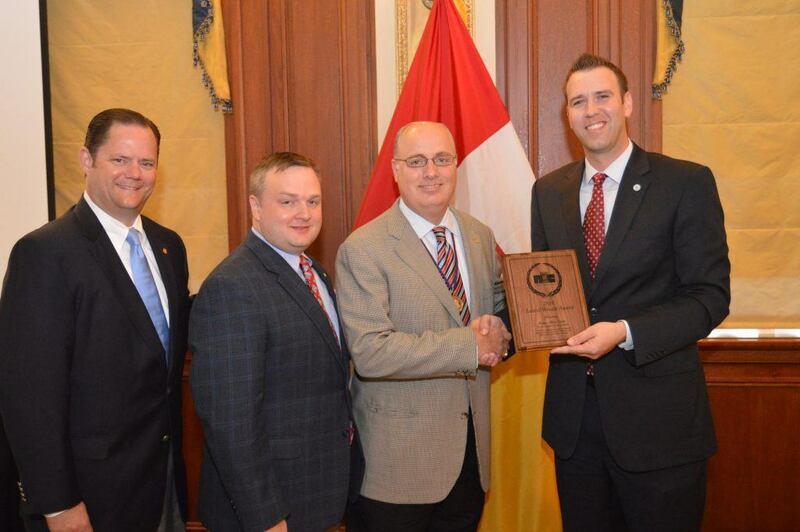 Kappa Alpha Order was recognized with the 2016 Laurel Wreath Award from the North-American Interfraternity Conference for development and implementation of the Social Strengths Workshop. The Laurel Wreath is presented to individuals or groups in recognition of their unique programs, community outreach, or influence within the fraternal world. Michael P. Wilson, chief financial officer of the North-American Interfraternity Conference, presented the Laurel Wreath Award to Knight Commander Darren S. Kay, assistant executive director for alumni affairs Brent W. Fellows, and executive director Larry Stanton Wiese at the 79th Meeting of the Advisory Council on Saturday, July 30th at The Skirvin Hilton Hotel in Oklahoma City. KA was one of six fraternities who collaborated to spearhead the development of the Social Strengths Workshop to educate members on sexual assault, relational violence, healthy relations and bystander intervention. Working with Aaron Boe of Prevention Culture, KA sought to address these important issues on college campuses by creating a student program with additional training materials for alumni. After working with Boe to develop the curriculum and implementation strategy, KA hosted Boe for an in-person workshop to take the Kappa Alpha Order staff through the course as well as training them to present the workshop to undergraduate chapters and alumni groups. Throughout the fall semester of 2015, every chapter of the Order received training through the workshop, reaching over 7,500 undergraduate members. Read more from the North-American Interfraternity Conference.